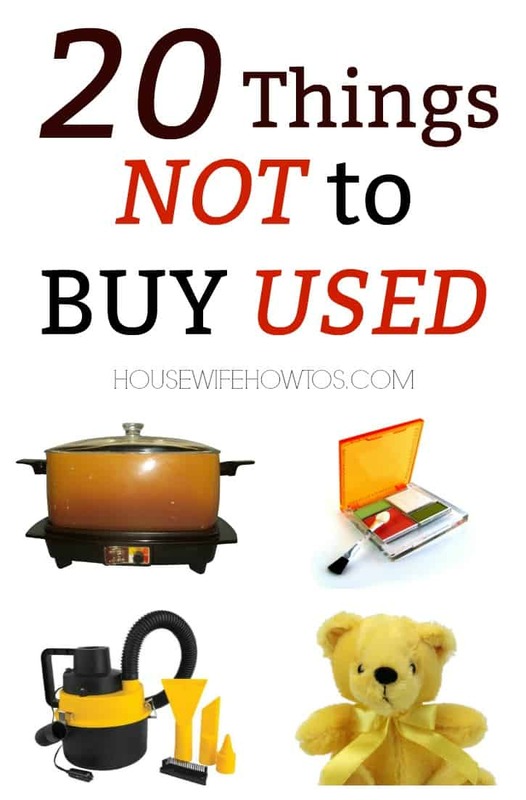 Consignment stores, garage sales, eBay, and Craigslist are all great ways to save money — provided you know the things not to buy used. When it comes to these items, it’s not just a matter of aesthetics or hygiene — in many cases, it’s a matter of safety, too. 1. Cribs and kids’ furniture: Both cribs and kids’ furniture are frequent subjects of safety recalls. Unless you take the time to look up the make and model number before buying a used one, you’ll never know if it’s been recalled. Also, both are things typically assembled by the consumer but there’s no way of knowing for sure the original owner put it together correctly, especially if they don’t have the original manual. Protect your children by buying these brand-new and assembling them yourself according to the manufacturer’s instructions. 2. Car seats: Car seats are designed to protect once, and should be replaced after an accident or crash. When buying used, there’s no way of knowing if the seat’s been through an accident before. Also, like cribs and kids’ furniture, they’re often subject to safety recalls. If that’s not enough to convince you, remember that car seat technology and safety improves every year. Your little bundle is too precious for you to pinch a penny over this. 3. Baby bottles: Although BPA in baby bottles is now banned, older models may still contain this endocrine system-disruptor. 4. Stuffed animals: As any mom knows, stuffed animals get greasy and dingy over time. Unfortunately, they don’t hold up to a hot wash cycle with bleach, so there’s no guarantee that used teddy bear isn’t full of bacteria, mold, mildew and, yes, even bed bugs. 5. Underwear and swimsuits: Although most people wouldn’t dream of buying someone else’s underwear, used swimsuits are just as bad. Both are worn next to skin for hours at a time and are prone to collecting bacteria. Since swimsuits aren’t supposed to be washed in hot water or subjected to dryer heat or bleach, it’s downright unhygienic to wear one that first belonged to someone else. 6. Shoes: It’s wonderful to save money on shoes, but the previous owners’ feet have shaped how the shoes will fit. Buy used, and you’re potentially buying misery and discomfort. 7. Hats: Do you really want to put someone else’s hair oils, skin cells, sweat, dander and possible lice on your head? If you absolutely can’t resist, at least treat it properly before wearing. 8. Bike helmets: Helmets are actually designed to protect you from ONE accident, not a series of them, and should be replaced after every bad spill. Many people don’t bother taking these precautions, though. Since damage doesn’t always show on the surface of the helmet, you’ll never know if a used helmet has already done its duty. 9. Wetsuits: The neoprene from which most wetsuits are made will eventually degrade over time without any changes in its appearance. If you’re going to buy a used one, make sure it’s not too old and hasn’t been worn more than a few times. 10. Mattresses and bedding: Mattresses and pillows collect skin cells, pet dander, dust mites and all sorts of nasty bacteria, not to mention bed bugs. About the only way to avoid this is to run the item through an extremely hot wash/dry cycle using bleach, a process that will most likely ruin your purchase. So skip the used, and buy new ones instead. 11. Lamps: Poorly wired lamps are one of the leading causes of house fires. Don’t buy someone else’s risk. But if you do, be sure to get it rewired before using it. 13. Slow cookers, blenders, and other small kitchen appliances: Blades get dull, gaskets degrade and motors wear out — all things you won’t know about until you’ve used the gadget. 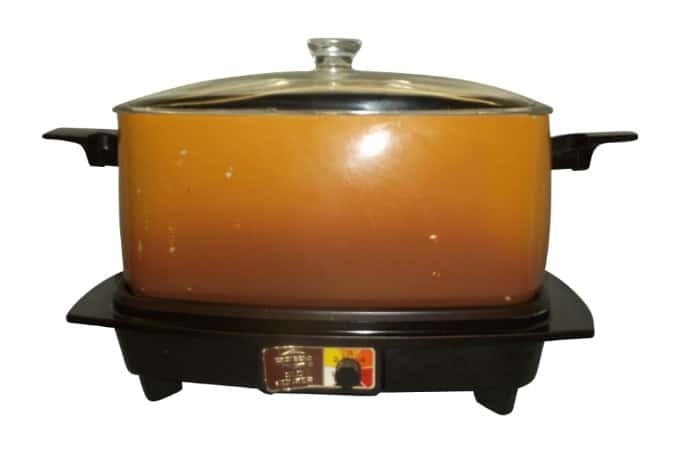 As for the slow cooker, well, you’ve seen This is Us. 15. Upholstered furniture: Like mattresses, upholstered furniture is often full of dust mites, dead skin cells, pet dander, and sometimes even bed bugs, yet it’s nearly impossible to launder. So, unless you’re very familiar with the condition of the previous owners’ home, buy new. 16. Laptops: Since they’re portable, laptops are prone to being dropped and banged, and you won’t know until you get the thing home and start getting hard disk errors or memory failures when you’re in the middle of finishing up that slideshow for tomorrow morning’s important meeting. Since laptop prices have dropped considerably over the past few years, consider it an investment and buy one that’s new. 17. Plasma, LED and HDTVs: Although not portable like a laptop, these electronics are also difficult to judge properly until you’ve got them home and have been using them a few hours. That’s when the screen will start flickering or go blank, and you’ll realize you wasted your money. If you’re going to buy used, do it from a manufacturer or certified refurbishing site, so you’re covered by at least some kind of warranty. 18. Computer games: Manufacturers now mostly issue single-use serial codes which become invalid after they’ve been entered. Registration then drops a cookie into your computer and makes entries in your registry. If the previous owner activated their game, you won’t be able to play it even if they provide you with the serial code they used, because you don’t have the proper registry entry and cookie. 19. Tires: Tires that have been involved in accidents are less stable and unreliable. If you’re going to buy used, make sure you get the tires’ complete history. 20. Makeup and makeup brushes: If unopened, okay. Otherwise, you might be putting yourself at risk for MRSA and other bacteria-caused infections. Funny story. I bought a beautiful set of drinking glasses at the Goodwill Store (love going there!). My husband refused to drink out of “hand-me-down” drinking glasses and instead would only use the old glasses. Joke’s on him, the other set of drinking glasses came from the Goodwill store too!! Almost all of my shoes are hand-me-downs or bought second hand and I have no trouble with them. Newer shoes will undeniably last longer than the same shoe bought secondhand, but I see no reason not to buy used shoes beyond that. It may depend on whether you’re a person prone to foot trouble, as I am. I have very high arches, so I absolutely must have support and have found that in used shoes the arches have already been worn down.